The Mekong River is rich in legend linking seven Asian nations from Tibet to the South China Sea. Perhaps the most mythical of Mekong experiences is a slow-boat river journey through Northern Laos, a timeless land still rich in exotic mysteries waiting to be discovered. It is The Luang Say Mekong River Cruise. Meet upon arrival at Houei Xay immigration checkpoint and transfer to the boat pier. The LuangSay boat leaves Houei Xay pier at 09.00 AM for a cruise down the Mekong River to Pakbeng. En route, one stop is made to observe rural life along the Mekong and discover minorities.Buffet lunch on board. Arrival in Pakbeng before sunset and check-in at the lodge. 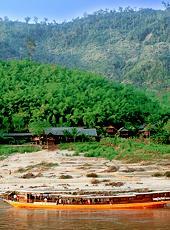 This rustic town-village sits on a steep hillside and offers spectacular views over the Mekong River. Dinner and accommodation at the lodge. (Optional: walk to Pakbeng market, where people from the surrounding village of minorities exchange their goods). Board the Pak Ou boat at 08.30 AM for the second leg of the cruise towards Luang Prabang, with a short stop to discover a Hmong village. Buffet lunch on board. Continue to Pak Ou village at the mouth of the Nam Ou River, and visit Tam Ting, "Caves of a thousand Buddha's”. Another brief stop is made at a local village, to observe the traditional process of obtaining local rice alcohol. Arrival in Luang Prabang before sunset. Tour ends. All prices inclusive of taxes unless stated otherwise in the Exclusion. Thai - Laos border, approximately 1.5 hour drive. the Laos visa in your country (if available) or at the Laos consulate in Bangkok before arrival.